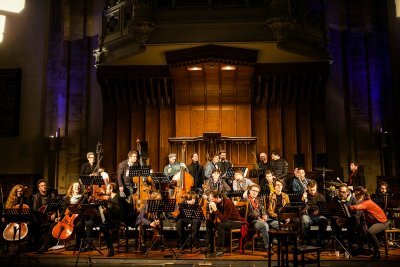 Founded in 2011, ONCEIM is a 34 musicians Paris-based orchestra which brings together high-level instrumentalists who develop their own completely personal instrumental practices and music styles. ONCEIM is dedicated to contemporary creation in an approach to sound as a plastic art form, by experimenting a number of different modes of musical elaboration, transmission and composition. In this work process, each musician has a major creative role, constructing the music through their singular virtuosity and the musical vocabulary they devise through their instrument.The orchestra has played in many places in Europe - Studio Venezia at the Venice Biennale, at the Sacrum Profanum festival in Krakow, the Edition Festival in Stockholm, VinterJazz in Copenhagen, "Le Guess Who ?" in Utrecht …This year, they’re using Studio Boerne in Berlin as an artistic residency and a place to perform improvisations as well as « Ambush » by Burkhard Beins and « NOTES&BLOC-NOTES » by Peter Ablinger. Part 3 - ONCEIM plays Bukhard Beins « Ambush ».